Fiddlehead Pullover Free Baby Knitting Pattern. 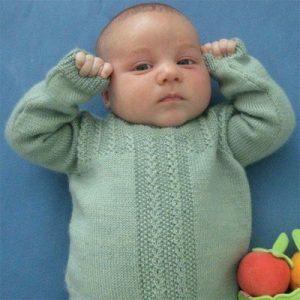 A sweet vintage inspired baby sweater featuring mock cables, seed stitch, and buttoned closures at the shoulders. Gauge: 32 sts and 44 rows = 4″ in stockinette stitch using larger needles, after blocking.